If you want your Glamping business to be successful you only need to know two words..... Love and Glamping. Our recent launch of a totally new Glamping concept lit up the internet. This wasn't because of my own efforts at SEO and Social Media Management. It is because Love Glamping gets to the top of all the customer searches with good photo presentation, concise descriptions and a great internet image. We are still responding to Love Glamping emails from the past two days, lovin this site. We are more than happy with the response that your company has done for us, not everyone’s email turns into a booking but the amount of emails that we get requesting dates for our camping pods and barn remains high. Once again THANK YOU for your support in promoting Glamping and all that it brings to camping, we have been very impressed with numbers from you guys, please keep up the really good work. Thanks so much! Love Glamping has been amazing!!! We've had lots of enquires and new guests too! So happy! Love Glamping has been operating for 7 years. We are all about Glamping and focus our efforts on ensuring we are listed on Page One of the search engines including Google for “Glamping and you region of the country” which in turn drives traffic to you! We continually make user experience and search improvements to our website, investing back into the directory and keeping up with user technology demands. What you get when you advertise with Love Glamping? Amendments at anytime! We manage your changes for you throughout the year saving you the hard work. 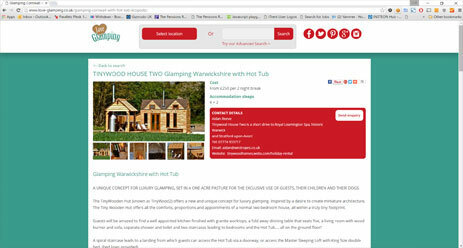 Check us out in the search engines for keywords Glamping and your region of the country! NO OTHER FEES OR COMMISSION! BUY NOW FOR JUST £125 FOR 12 MONTHS! HERE IS WHAT WIL HAPPEN ONCE YOU HAVE PAID FOR YOUR LISTING FEE….